It looks as though these vehicles have been lined up for some great task; perhaps, at any moment, thousands of workers will arrive at the lot, man the cabins, and stream into America’s poorest large city to repair its thousands of broken street and traffic lights, fill the potholes that mar nearly every street, prepare its antiquated drainage system for the harsh Michigan winter, and remove the trash piled up in neighborhoods and parks. But these vehicles have been assembled to a different end. As part of the largest municipal bankruptcy in history, the city has turned over nearly 500 vehicles and other pieces of city infrastructure, the vast majority of them in completely functional condition, for auction to the highest bidder. Over 130 public lighting vehicles, 120 garbage trucks, more than 70 busses, and 24 lift buckets are parked in the vacant lot of the Herman Kiefer Health Complex, which was shuttered earlier this year and is itself being auctioned off. 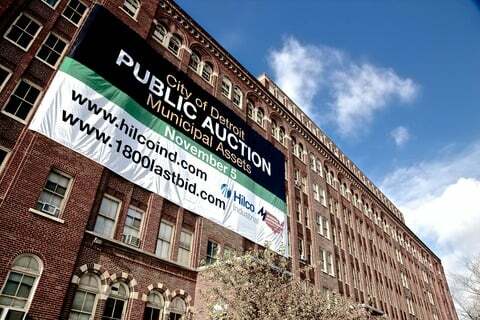 The city sold the vehicles to Hilco Industrial and Miedema Auctioneering and Appraisals, who are conducting the auction, for $5 million. The garbage trucks alone, new, cost more than three times that amount. The sell-off of city assets is being coordinated with the city’s bankruptcy, which is expected to receive final approval from Judge Stephen W. Rhodes on Friday. 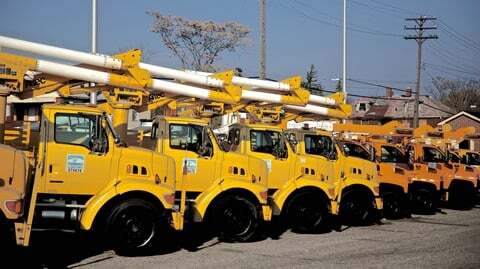 As part of the bankruptcy, the city’s public lighting services have been contracted out to DTE Energy, the former employer of Detroit Ex-Mayor David Bing, and the city’s garbage collection has been privatized. The city’s water and sewerage department was spun off to a regional authority, which relies heavily on contract work. 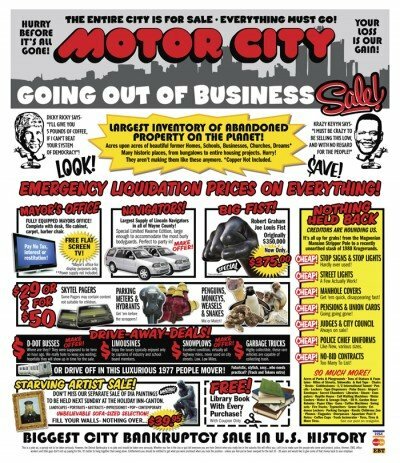 The city’s charter would have prohibited these privatizations without a popular vote, but city officials have used the bankruptcy to steamroll over legal protections, with millions being made by well-connected private individuals as a result. The entire process is being coordinated with a handful of billionaires who have bought up key portions of the city’s assets for pennies on the dollar. Major municipal trade unions, whose officials are getting a cut of the proceeds in the form of control over a retiree health care trust fund, have signed off on the bankruptcy, despite the fact that city workers and retirees will have their pensions and benefits slashed. 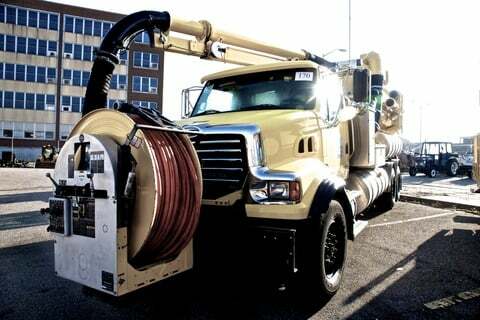 Everything necessary to maintain a major city was for sale: salt spreaders, generators, light towers, sewage trucks, cable reels of every sort, digging vehicles, and construction trucks. The city, the majority of whose streets remained unplowed during last year’s harsh winter, is selling off 40 truck-mounted snowplows, as well as the trucks that mounted them. Auction buyers, mostly small business people looking to stock up on low-cost equipment, or small resellers like Isador, were amazed at the quality of the vehicles put up for sale. “This stuff is like new,” prospective buyers could be heard saying on their cell phones. Only about five to ten percent of the equipment being sold was not in working order, buyers said. Bidding began at 10AM on Wednesday. Nearly 200 auction attendees sat in the Coleman Young auditorium in the County City Building in downtown Detroit, many wearing worn jeans and work boots. The auctioneer rattled off bids and prices in rapid-fire auction jargon. “Who’ll give me five hundred dollars? “I know the values of everything here,” Isador said. 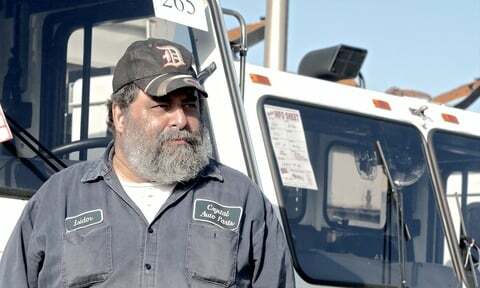 “It’s what I do for a living.” Some of the sewer trucks here cost $300,000 new, and some of the boom trucks cost $90,000 or more.” He estimated that the city was paid about $10,000 per vehicle by the auction companies. In addition to privatizing garbage collection and street lighting, the city has spun off its water and sewerage department to a regional authority, which has increasingly replaced city workers with contractors.